Everything seemed rosy on paper for the Washington Nationals and their burgeoning payroll that with incentives will be over $200 million and among the tops in baseball next to the Red Sox and Cubs. How they got to $200 million was via snapping up free agents like Patrick Corbin, Brian Dozier, Trevor Rosenthal, Matt Adams, Anibal Sanchez, Kurt Suzuki, Jeremy Hellickson, and Tony Sipp. The team also traded for Kyle Barraclough and Yan Gomes and the roster was mostly set. When free agency opened for business after the World Series ended, the Washington Nationals pounced and snapped up Trevor Rosenthal like they caught other teams napping. They made him the first free agent signing of the year. The one-year deal will pay the former closer $6 million with a $1 million buyout along with a lucrative appearance incentives package in a deal structured by agent Scott Boras that could pay Rosenthal up to $15 million maximum this year if he meets most incentives. In addition, there is a $15 million conditional player option for 2020 that Rosenthal can exercise if he has 50 games pitched or 30 games finished for the 2019 season. Rosenthal is a Tommy John elbow surgery survivor and missed all of the 2018 season and was released by the St. Louis Cardinals. Rosenthal was an all-star closer who had back-to-back 40-save seasons on his resumé. After his TJ surgery, the 28-year-old reliever virtually disappeared from baseball and spent 14 months in the TJ rehab protocol even though he could have tried a 2018 comeback but instead chose to sit out the entire season. Last October, Boras held a showcase in Los Angeles that many teams attended. Did we mention Rosenthal’s impressive resumé? It is certainly a case of “what have you done for me lately” but there are all of the earned accolades for the 8th youngest pitcher in MLB history with 100 saves, and one of only six pitchers to record at least 120 saves and strike out at least 400 batters is past history. So what is wrong with Rosey? What we could see was he is just not locating his pitches, but he has also run into some bad luck and some bad umpiring. 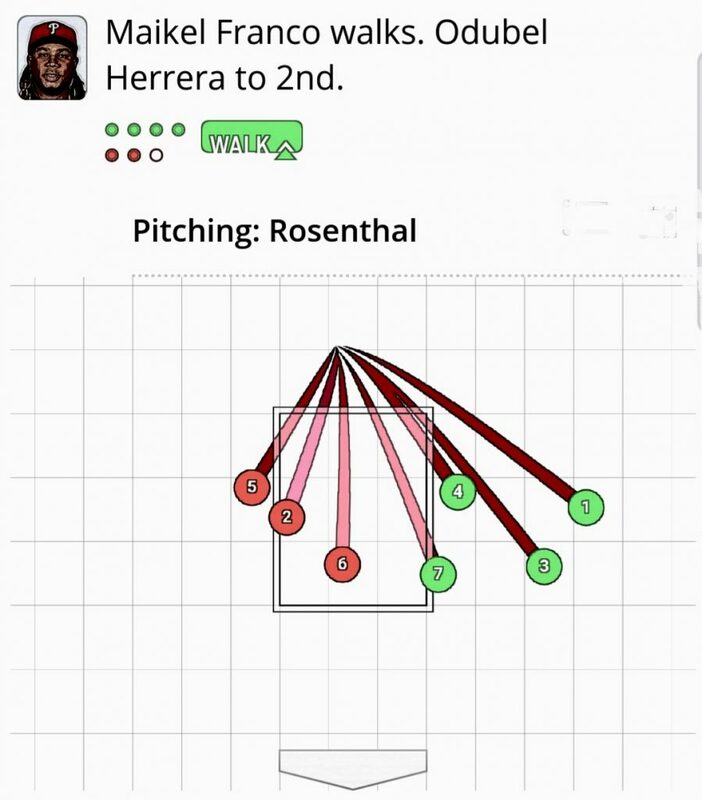 In the above chart, all strikes were from foul balls and that 7th pitch was “painted” and in a 3-2 count we have seen much less called a strike — just ask Juan Soto and Anthony Rendon who were both punched-out on strike 3 calls this week in disbelief. Rosenthal on the surface is not losing faith or his sense of humor, but the fans certainly have. “I’m going to get the ball authenticated when I get my first out,” Rosenthal said half-jokingly. If Rosenthal can figure it out, the Nats can right their bullpen ship which is struggling. They got rid of Sammy Solis during Spring Training and sent Austen Williams to Triple-A and kept Wander Suero who had a very mediocre Spring Training with a 1.421 WHIP while entering late in the Grapefruit games facing mostly guys with no names on their jerseys. The answer seems as simple as the Lerner ownership group agreeing to sign Craig Kimbrel who is still available as a free agent, but that move would certainly cost in excess of the CBT tax threshold which the team wants to avoid. Not only would there be a 50% tax penalty making an $18 million deal really cost $27 million due to the tax penalty, it also would certainly put the Nationals deep in the red for a team that is expected to see a drop in revenues and attendance. The Nats would also have to forfeit their 3rd round draft pick if they sign Kimbrel now after they have already forfeited their 2nd round draft pick when they signed Patrick Corbin. Even if Rosenthal returns to form, Kimbrel could create the super bullpen, and Sean Doolittle could move to more Hi-Lev situations late in the game like we have already seen in this young season. In the meantime, Rosenthal needs to get back on track. Yesterday, we saw a troubling pattern too early in the season where Stephen Strasburg was pushed hard in the game. 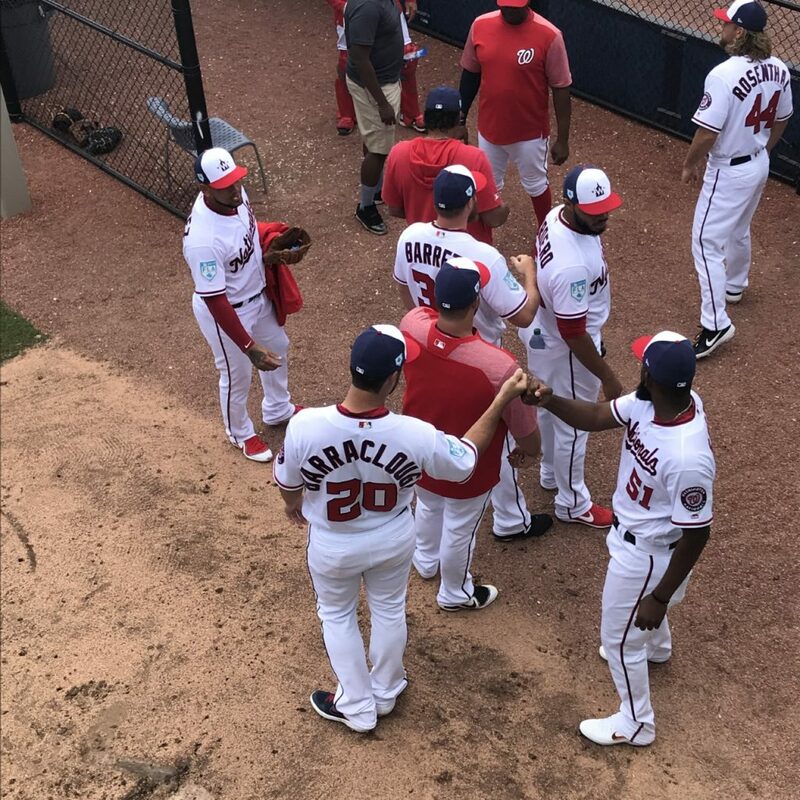 Strasburg could have finished his game with a 1-hitter in the 7th inning with 2 outs and 102 pitches but manager Dave Martinez extended Strasburg in the game to face two more batters who both singled and the stress meter started redlining in a 2-0 game. Strasburg finished with 108 pitches, and looked great. He probably could have gone further with little to gain as Grace was warmed and ready earlier. If we have learned anything with Strasburg, it is that less is more to keep him healthy. Last year, Martinez pitched Stras a total of 8 games in a row from the end of April forward with no less than 103 pitches and one game of 115 pitches, and Strasburg ended up on the disabled list after that. It’s like we never learn, but this also seemed to be a reaction to the poor bullpen that had a combined ERA over 11.00 before yesterday’s game which was by far the worst in the Majors. So far Justin Miller has been the saving grace of the bullpen with that sparkling 0.818 WHIP and 0.00 ERA, but last year he had a 0.00 ERA into his 9th appearance and was never the same after that. Why? Well look at his use and usage with all of the ups and downs of short stints then going 40 pitches and 54 pitches in games. He could be right back on the same pattern. He pitched 2 innings on Wednesday then was signaled in again yesterday. Davey was grilled on this in his postgame presser and sheepishly tried to defend his usage by giving a lame answer instead of the truth that he needed arms he could count on — and therein lies the problem that you cannot rely on Rosenthal and Wander Suero right now. Suero, with his 3.75 WHIP, is the worst on the team, and the only other reliever who was not used yesterday was Kyle Barraclough who has a 2.10 WHIP. So why is Suero on the roster as he has options and can be sent down. Are the other choices that bad? Martinez is relying on “Everday” Matt Grace and Justin Miller so far for the extra workload and Sean Doolittle and Miller have both pitched 3 2/3 innings for the team lead out of the bullpen. Sure, he wants to pitch but nobody wants to have their arm abused. Stick with sound analytics and patterns and you will get more from your players. Again for accuracy, Miller pitched 3 innings twice last year, but is that and was that smart? There was the reason the oddsmakers tabbed Martinez as the first manager to get fired in 2019. He is under fire, and he knows it so you have to guess with the Davey Martinez that the end justifies the means.